Interesting how meals play such a significant role in special occasions such as birthdays, anniversaries, Thanksgiving and Christmas. I suppose if we are going to eat, we might as well enjoy it, and therefore, food or meals or wonderfully prepared meals seem to play such a logical role in most special occasions. Don’t you think it is interesting that a meal plays such an important role in Israel’s ultimate deliverance? Why do you think this is so? Why would God connect his greatest, most devastating and deadly plague to a simple sacrificial meal? 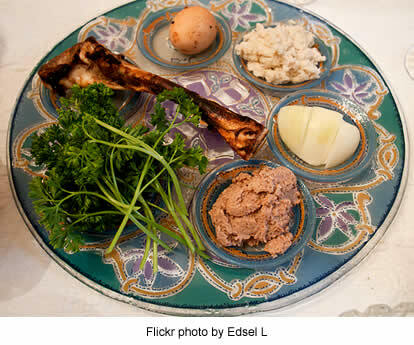 How does this meal…the Passover…relate to our meal that commemorates our Lord’s sacrifice for sin? Some interpret that the early church’s “breaking of bread, as described in Acts 2:42ff was actually their observing the Lord’s sacrifice—his broken body and shed blood–at every meal. If so, why do you think observing the Lord’s communion with them at every meal was so important to them? Could it possibly have had anything to do with that they might have been thinking that his return to establish his earthly kingdom was imminent? Therefore with every meal, they were expressing their hope that their Savior was about to return and be with them again? And yet, as we know, this turned out not to be God’s plan? Why not? So that the message of his story would expand to the utter most parts of the world and that others would also be allowed to share in this most meaningful and yet simplest of meals? • There are 10 Consecutive, Pervasive and Devastating Curses are Unleashed upon Egypt. • 10x the text clearly says that Yahweh God distinguishes between Israel and Egypt with respect to the plagues’ devastating affects. In Moses’ Song of Deliverance after the salvific crossing of the Red Sea, he will ask, “Who is like you among the gods, O Yahweh?” (Ex. 15:11). Later, when Moses is met by his father-in-law, Jethro, in the wilderness, where Moses first received his commission by Yahweh to administer Israel’s deliverance from Egypt, Jethro will bless Moses with these words: “Now I know that Yahweh is greater than all the gods” (Ex. 18:11). I am Yahweh your God, who brought you out of slavery in Egypt. Unlike, Egypt, you shall have no other gods before me; nor shall you make any idols for yourselves, and you shall certainly not worship them for I am a jealous God, and you have just seen how easily I was able to humble and humiliate the greatest nation on the planet and its semi-divine leader. Believe you me, I will not spare my rod of discipline for your disobedience to my covenant–upon you who have seen my grace–for at least four generations to come. • At the same time, there are 17 references to the “hardening” of Pharaoh’s heart. • 7 times Yahweh predicts that Pharaoh will not listen. So what’s the point to all this protracted salvific drama? Undisputed Truth about both man’s Mighty Creator and the Creator’s fickle creature. What’s the point to all of this back and forth “repenting” for not releasing Israel and then changing her mind again not to “release” Israel? Perhaps there are several reasons, two of which are: 1) whether influenced by God or not, the obvious fickleness and stubbornness of man’s fallen, sinful will. To one degree or another, don’t we all go back and forth in our thinking, feeling and behaving? We believe pain has taught us, but once the pain has subsided and goes away, seemingly, we must make sure that the pain we suffered was a really a consequence of our behavior, and so, we must repeatedly learn our painful lesson again and again, until we are finally crushed and left with no other conclusions nor any other means of escape or rationalization. As fallen, deceitful creatures, we can be very obstinate in our willingness to truly learn who is really in charge and who is really our salvation. So it was with Pharaoh, who, blinded by centuries of handed wealth and power, never seemed to fully accept or embrace who was really in charge. 2) Yahweh tells Moses, before and during the unleashing of the plagues, that “I will harden Pharaoh’s heart that I may multiply my signs and wonders in the land of Egypt, and when Pharaoh refuses to listen, I will lay my hand on Egypt and bring out…my people the sons of Israel” (7:2-3; 11:9-10). “The Egyptians shall know that I am I AM (Yahweh) and that there is no one like me in all the earth. For if by now I had put forth my hand…, you would have been cut off from the earth, but for this reason I have allowed you to remain—to show you my power and in order to proclaim my name through all the earth” (9:14-15). In other words, the greater Egypt’s resistance, the greater her defeat and the greater, her overcomer, Yahweh God. Finally, when Pharaoh’s pursuing cavalry is about to be utterly annihilated, Yahweh declares, “I will be honored through Pharaoh and all his army, and the Egyptians will know that I AM is that one God that truly exists, and not man’s many gods (14:3, 17). So with this one protracted drama acted out on history’s stage, God reveals the truth concerning God and man. God is big; man is small. Though for a time, it may seem that man can be God, when man attempts to play God, he is ultimately crushed by God, and those who chose to keep God God and man man, or those that ally themselves with God through faith, with will not only be delivered from corrupt man, but will be rewarded for their trust. 2 “This month is to be for you the first month, the first month of your year. Why is this the first month? Because it is their day of independence when the Lord delivered them out of Egypt? How do they know when to start this month so that they know when the tenth day is? Why a perfect lamb? What represented a defect? Why goat too? Why only a year-old? Tender? Young? Why male? How were they to take care of them? Fatten them up? Treat them well? Differently? Why twilight? Why at the same time? Why must have this sounded like? Was the smell of blood in the air? Was the blood drained out? Why were they to do this? Was this a word picture to them? A symbol? A sign to the Passover Angel, perhaps the pre-incarnate LORD himself to not touch this family or their first-born, as he would the Egyptians? What a gruesome sight, to spread blood over your front door post. Meat of the lamb? What were the bitter herbs and why? Why bread without yeast? 9 Do not eat the meat raw or cooked in water, but roast it over the fire –head, legs and inner parts. Even the head? Even the guts? Why? Why throw it out? Did the food serve as a purpose? Set aside for only this one night, only this one meal—an act of worship? Why burn it? Destroy it? As if you are getting ready to go somewhere? Did they not normally eat with their shoes on? Sounds like us, on the run. Why is it called the LORD’s Passover? Is he about to pass over? 12 “On that same night I will pass through Egypt and strike down every firstborn –both men and animals –and I will bring judgment on all the gods of Egypt. I am the LORD. Why animals? That the gods are not real, but demonic spirits that must ultimately be subservient to the Creator God? 14 “This is a day you are to commemorate; for the generations to come you shall celebrate it as a festival to the LORD –a lasting ordinance. And it still is, some 3400 years later. And for six more days they were not to eat any bread made with yeast. Why? What is the big deal with yeast? It causes the bread to rise? It takes time? It causes a chemical reaction with the air or oxygen therefore filling the bread with gas or air, thus causing the flour mixture to rise. When baked the bread is larger and fluffier than bread made without yeast? Does yeast stand for something? Hypocrisy? Sin? Something that puffs up, that is not real, fake, corrupt? To not do this was a serious crime within Israel? Were there hygienic reasons to throw out the yeast and start over? How does one make yeast? 16 On the first day hold a sacred assembly, and another one on the seventh day. Do no work at all on these days, except to prepare food for everyone to eat –that is all you may do. What is a sacred assembly? A worship service? There is no tabernacle yet? The next year there will be. Does the fourteenth always fall on a Sabbath or not? I don’t think so. So did they worship on the 14th and the 21st as well as the Sabbath in between? Didn’t the Passover fall on a Sabbath, the same day or night that Jesus was crucified or something like that? Then what did he celebrate with his disciples in the upper room the night before, just before he was arrested? So for the whole week or just the 14th and 21st there was to be no work? Notice the women could cook. Or did the men kill and roast the meat? Why no work? 17 “Celebrate the Feast of Unleavened Bread, because it was on this very day that I brought your divisions out of Egypt. Celebrate this day as a lasting ordinance for the generations to come. Is Passover the same as the Feast of Unleavened Bread or is the feast the whole week of using unleavened bread? Why has this tradition carried on so strongly? Why does he restate this? • Basically these instructions are somewhat repeated in vv. 17-20. Summary… God tells Moses and Aaron about a special meal and feast that they are to eat. They are to slaughter and perfect, young lamb or goat, roast its meat and eat it along with bitter herbs and bread made without leaven. They are to take a portion of the lamb’s blood and put it on the doorframes of their homes. That night the Lord will Passover their homes and spare them, but he will destroy the first-born of the Egyptians and their gods. For the next seven days they are to also get rid of all leaven and hold two worship assemblies at the beginning and the end of the week. They are to do this as a lasting ordinance wherever they live for generations to come. God accompanies this last and final terrible plague with a simple sacrificial memorial meal of roasted lamb, bitter herbs and unleavened bread. This meal is then connected to a larger festival that is to be celebrated for generations and in which only bread without leaven can be made and eaten. • God involves his people in their deliverance, even if only in a small way. In this case, the lamb and the lamb’s blood deliver them from the same fate of the Egyptian firstborn. In other words, it separates them from those that don’t trust, worship and obey. At the same time, it still costs them, and it feeds them. • God communicates and teaches with living word pictures and celebration. • God is a God of deliverance—deliverance through sacrifice. • He will ultimately pass judgment upon all false gods and/or demons. • God associates his worship or relationship with celebration. • God is a God of new beginnings. • He also keeps his word. His words are truth; his words are actions, even if only in the future to us. • He is also fair and practical with the sharing of a lamb by smaller families. Principle or Truth… Even though it may be small, I have a small part in God’s deliverance. 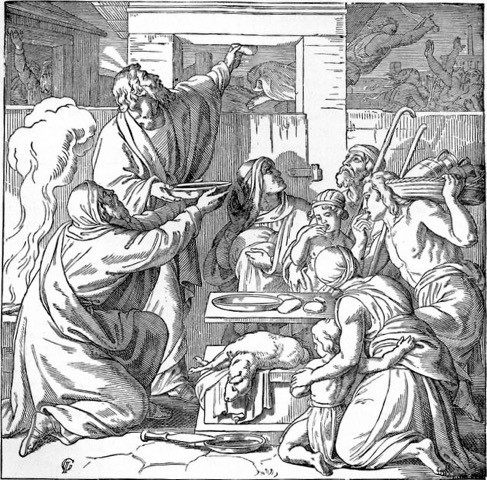 Israel sacrificed a precious lamb, sprinkled its blood on their doorposts and ate its meat, along with bitter herbs and unleavened bread in haste, as if to say God will deliver us on this night. Application… Whether it be my small sacrificial lamb, a prayer, some act of obedience, an extra $30/month in giving or whatever, I rejoice in the fact that God allows me to have a small part in my overall care, provision deliverance, whether it is spiritually, via my faith, or in this case $30 to have a shot at keeping our part-time worship minister. God allows me to have a small part, kind of like a dad allowing his son to hammer the nail with his toy hammer along side his dad as he labors on the family home. God is doing the saving, but he allows me to have a part—a tangible taste, so that I can connect. I was there. I saw him do it. God delivered. And all I did was…. 2015 Epilogue… Fellowship was not able to come up with the necessary support to keep our worship pastor, but he did go on to become the lead worship pastor at one of the largest, fastest growing churches in the Midwest. He was truly a talented and gifted worship leader. In his place, Fellowship was blessed with someone equally passionate and gifted at leading worship who, because of his own successful photography business, coordinates Fellowship’s worship pro bono. In addition, under Shann’s passionate leadership, just about everyone on Fellowship’s worship team can and has led worship at one time or another. God replanted one productive and thriving vine and created more in his place. God is amazing. Thanksgiving… My Spiritual daughter survived another test recently; her faith, wisdom, thinking process and sobriety grows stronger with each and every day. Thank you, Lord. Thank you. I continue to be extraordinarily captured by everything I am learning in John these days. Because of a curiostiy of wanting to better understand what the angel meant when he told Joseph that the son that was to be born to Mary was to be named Jesus because he would save the people from their sins, God has taught me so much. I have a better understanding of what sin is and how Jesus’ death atones for our sins so that God forgives us of our sins, which in turn means our entrance into heaven or paradise with God forever was never going to be about the impossible proposition of whether our good works outnumbered our mistakes. Of course, one’s good deeds would never outnumber his mistakes. We are too mistake-prone to begin with. Everything we do is tainted with selfish, sinful imperfection. Only grace…only the favor of God granted through the gift of his Son and his Son’s willing sacrifice to atone for the sins of the world could offer any man deliverance from the Spiritual consequences of his many faulty choices. And now after exploring Jesus’ words in the Gospel of John, especially his final words uttered in the upper room to his disciples shortly before he would give his life as a sacrifice for the sins of the world, I am more fully convinced than ever that salvation is not just about trusting Christ’s atonement, but loving others, and that you can’t separate the two. We were saved from God’s righteous judgment of our sinful imperfection for the good work or grace of Spiritually loving others. That is being in the vine. That is bearing good fruit…fruit that lasts….fruit that gives heaven joy (John 15). It would seem that, according to John’s writings, that all of life can be reduced to these two constant, daily actions…trust and love…trusting God and loving others as he loved his own. I am blessed by your words, my Savior. I am forever blessed. I have the vine. I am in the vine. I have your Spirit. I have your power, love, joy and friendship, as well as, the world’s hatred, and for this I am grateful…for this I am enriched; I am blessed…forever. You are the vine, and I am the branch, and apart from you, I can do nothing good…nothing intrinsically truly loving…truly fruitul. May others read, study, understand, accept, trust, live out, be blessed and bless others by your Spiritually enthralling truth. Truth… That through a simple sacrificial meal, God chooses to save his people, and though this salvation is seemingly without parallel, it is a meal that ultimately foreshadows a meal that commemorates a much greater sacrifice and a much greater salvation—the Son of God will die for the sins of the world. And all who eat of this bread and drink of this cup by faith will have their sins passed or looked over and forgiven forever. Application… the dynamic process of understanding my portion of God’s ongoing Spiritual deliverance…my portion of the meal…my sacrifice. Is it mere trust…well, I don’t mean mere trust because trust is not always easy? God has provided the sacrifice…his Son…and yet, to trust…to obey…requires lots and lots of sacrifice…sacrifice of what I want in the moment for something greater, lasting and infinitely more valuable. But this sacrifice…my sacrifices follow or are based upon God’s infinite sacrifice for me. I don’t sacrifice to appease God; I sacrifice because I have been loved. I am loved. I will always be loved. Therefore my life becomes a daily, living sacrifice of trust, growth, change, hope, obedience and love. I love because I have been love. I sacrifice because I have been sacrificed for. Thanks for the meal, Lord. Thanks for THE SACRIFICE. Thanks for teaching me the incredible joy of sacrifice in the name of your Son. Today, I offer this imperfect study. I offer my imperfect self. I offer my ignorance, my desire, my angst, my fear, my perfectionism, my distraction, my immaturity, my life and so so much more… Sacrifice all that I am and ever hope to be, and may my sacrifice bring glory to your name as others grasp your amazing love. This entry was posted in Learning Center Lessons and tagged deliverance, meals, Moses, Passover on February 7, 2015 by admin.